It’s difficult to describe what one’s eyes can see, almost impossible to convey their emotion. The cobalt blue shade of the lake caressing the musky green of “La Rocca” of Garda. The purple lights of the sunset that colours everything. Every night the sight of the moon reflecting on the calm waters of the lake. The Excelsior overlooks the Gulf of Garda, very close to the town center; a privileged and unique position. Comfortableness, peace and quiet will be your sole companion for every moment. 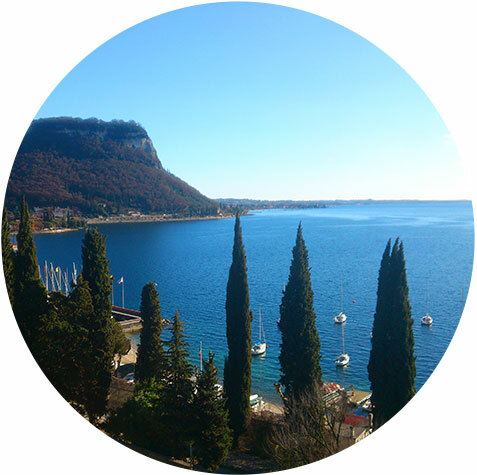 The lake is right at your feet, on one side the green “Rocca of Garda” is smiling at you and on the other side the romantic hamlet of San Vigilio. Soft colors, background music, the scent of orange blossom flowers envelops the hotel and induce rest and peacefulness. A Jewel for our guests. Few steps from the Hotel, directly on the beach towards Punta San Vigilio, you’ll find an exclusive garden providing sun beds and umbrellas. In collaboration with the Hotelier Association of Garda we propose you eight paths to suit all tastes. Walks and bike tours from 3.5 km to 18 km and heights from 120 mt to 380 mt. Book directly the Hotel Excelsior Le Terrazze and choose the best rate avaiable at this time for the date of your stay.